The Marvellous Mr. Green is one of the well-known and best-selling games from NetEnt Software, which focuses on a very series yet intriguing fictitious game theme. Although the game theme may look quite serious, the gameplay and bonus scoring spree does not stop right here. NetEnt have ensured to provide the players a visual and adventurous retreat in the fictitious world of Mr. Green. The theme story of the game explains Mr. Green has already lost his loved fiancée and accounts that an unknown creature, vows to become a werewolf hunter. He has taken up measures to fight and take revenge against the creature. The game follows an action and adventure-filled ride of the pursuit of Mr. Green. The game is available to play online for real money and is available across all the popular casinos in the world where NetEnt’s games are supported predominantly. Thus, in countries such as UK and USA, the game is available in plenty of casinos. Coins: The number of coins at the player’s main account both before and after waging. Autoplay: The reels will play automatically and the players need not to spin separately on every occasion. Level: The bet levels according to the bet per line in coins can always be manipulated. The game in general contains 15 symbols, five reels and 20 paylines to start with. In the 20 active paylines, the winning combinations are formed. The bets per each of these 20 lines tend to be same. Other aspects starting from the amount of bet and coin values completely depend on the players and how much investment he can put up. On continuing the same process, the slot accepts over 100 Euros per spin. The game consists of standard gaming symbols such as the images of main hero, a sacred girl, a werewolf and a gun with extra loaded bullets along with normal card symbols extending from 9 to ace. Wilds: The Wild Symbol in the game is the symbol of a bowler and it just has one noteworthy mentioning function. As like any other slot machine, Wilds in the game just acts a trump substitute any other lower valued symbols. Thus, no separate rewards can be won with Wilds. Plus, Scatters doesn’t get replaced by using Wilds. Scatter (a silver bullet decorated with ornaments): The scatter sign triggers 10 free spins, which are awarded on hitting three scatters anywhere on the screens. Multipliers: This only appears on the fifth reel. The valuation of multiplying depends on the index of the formed combinations. The minimum multiplier range starts from X2 and at maximum can reach X6. The Marvellous Mr. Green slot machine game is a product of NetEnt Software. The game takes the players from the world of online slot casino to a world of action-filled fantasy warfare. The game follows the fictitious story of Mr. Green, who is on a hunting spree to kill the killer of his loved ones. The slot quality is undoubtedly very high and extremely exciting to play. The game is always available to be played for free and can be done without having registered anywhere. The game in general requires no download and can be played in popular casinos such as the Mr. Green Casino. However, to play free The Marvellous Mr. Green casino slot machine game, there might be certain restrictions when it comes to payout and related schemes. The game is available to play in almost all popular OS devices, starting from iOS to Android; almost all of them support in The Marvellous Mr. Green slot machine game. 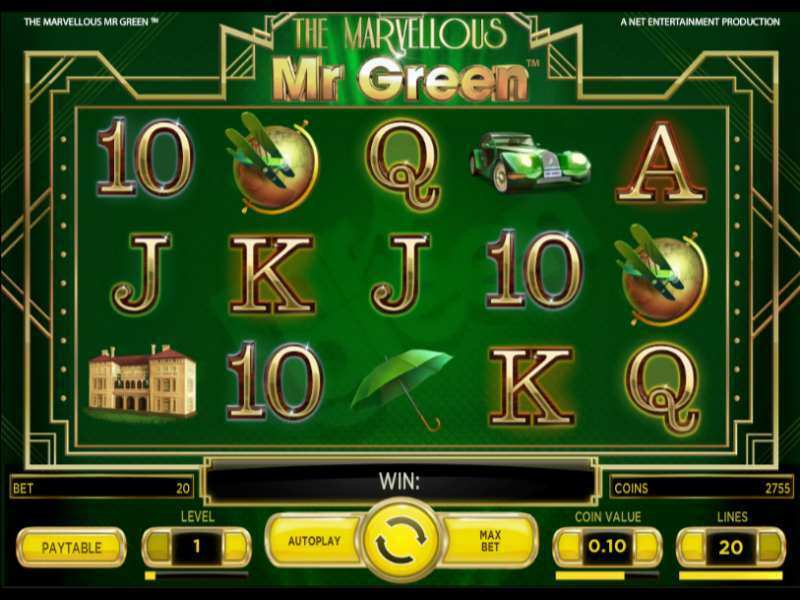 0 responses to "The Marvellous Mr Green Slot"